Like us on Facebook or Follow us on Twitter to receive regular updates about our programs. The world is witnessing the decline and disenchantment with democracy, and the rise of new forms of authoritarianism and illiberal regimes across the globe. What can we learn about the politics of illiberalism from across both East and West, and North and South, in a time of increasing political unpredictability? This public plenary puts these traditions in conversation to draw out global and comparative insights on illiberal regimes, examining, for example, how democratic institutions are leveraged, manipulated, and decoupled from arbitrary power. These questions are increasingly pressing in an age of global integration and the reconfiguration of the nation-state. For previous events, please visit our Past Events page. 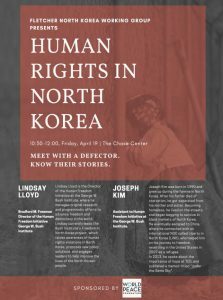 The North Korea working group at the Fletcher School of Law and Diplomacy presents “Human Rights in North Korea” to examine North Korea’s human security issues in order to raise concern and support for justice, human freedom, and peace in North Korea. Hear first-hand testimonies of the speakers experiences in North Korea to expand the spectrum of knowledge and understanding of peace with a human security approach. Lindsay Lloyd is the Director of the Human Freedom Initiative at the George W. Bush Institute, where he manages original research and programmatic efforts to advance freedom and democracy in the world. Lindsay currently leads the Bush Institute’s Freedom in North Korea project, which raises awareness of human rights violations in North Korea, proposes new policy solutions, and engages leaders to help improve the lives of the North Korean people. Joseph Kim was born in 1990 and grew up during the famine in North Korea. After his father died of starvation, he got separated from his mother and sister. Becoming homeless, he lived on the streets and began begging to survive in black markets of North Korea. He eventually escaped to China, where he connected with an international NGO called Liberty in North Korea (LiNK), who helped him on his journey to freedom, resettling in the United States in 2007 as a refugee. Speakers: Alex de Waal, Wayne Jordash (GRC), Catriona Murdoch (GRC), Ali Aljasem (Damaan Humanitarian Organization ) and Federica D’Alessandra (Oxford Programme on International Peace and Security at the Blavatnik School of Government’s Institute for Ethics, Law, and Armed Conflict).